You know, there are some new operas that just don’t interest me that much. There’s something uninspired or over academic about some of the stuff that I’ve seen recently that has left me cold. Then Teri* told me she was auditioning for a Zombie Opera. And I was intrigued. Regular readers know that Geoff is something of a zombie connoisseur. He loves to read about them, watch movies about them, and kill them (repeatedly) in video games. But this one is a first even for him. Teri auditioned for and got a part in La Zombiata. It’s an opera with zombies. On Valentine’s weekend. It has a splash zone. Here are the details. If you’re local you should go. Spend your Valentine’s Day weekend with braaaaiiiins. And song. 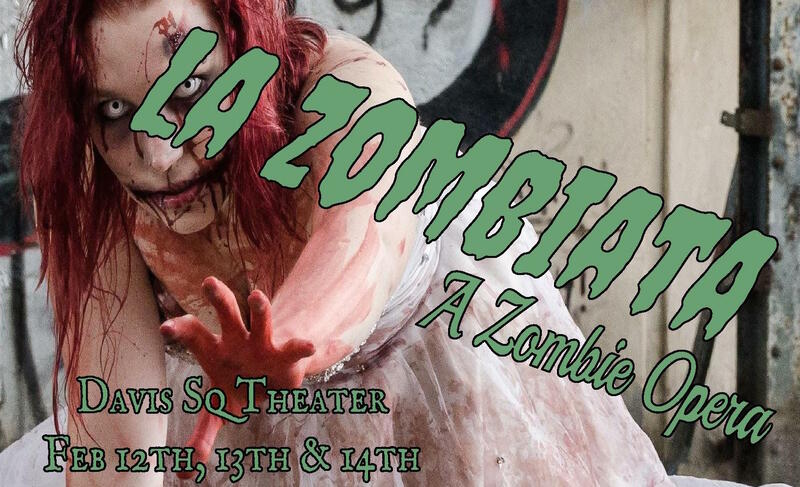 La Zombiata is the first opera being put up by Whole Tone Opera, a new opera company here in the Boston area. Click here to buy tickets for this Valentine’s Day weekend extravaganza. Click here to support Whole Tone Opera via Indiegogo. *I may have mentioned this before, but Teri does the BEST zombie walk/shuffle. You should ask her about it, she can teach you to do it.